On September 29th 2017, I shut down my multi-million dollar business that had just started to build real momentum. I launched LeadCraft in May 2016, so I could help entrepreneurs with their lead generation online. We succeeded, helping hundreds of business owners improve their marketing funnels and turn their customers into raving fans. This was my 4th 7-figure business, and for over a year I figured it would be “the” business. Yet over the summer of 2017, something didn’t feel right. I wasn’t sure what, and I found the whole experience frustrating, because in the early parts of 2017 I made more money than I ever had before. But I didn’t enjoy it. I used to wake up each morning excited. Not anymore. I had all this money and authority, but I realized it left me with less freedom. Worst of all, I didn’t feel like I was making the impact I could (for me, or for those I serve). I felt low… real low. I felt lost, but after five days in those Utah mountains (having deep conversations with people like Jesse Elder, Zach Obront and Chris Stoikos) I decided to choose option #3. The next day, I called my COO and told him what we were going to do. That’s when I killed-off LeadCraft. It took less than five days. Five days to blow up a multi-million dollar business that I ‘thought’ was “the” business. It should have been hard, but it was the easiest decision I’ve ever made because we weren’t serving our audience like we could. We were making more money than ever. But I did care. I knew we could do more to serve our audience. And that knowledge was eating away at me. I emotionally ate junk food. I put on weight and felt terrible. I was depressed, despite seeming to have it “all”. If I was going to run a business, it was either going to transform lives with the best possible results. I didn’t want to make more money selling a course. I wanted to create real transformations for my clients. So I shut down LeadCraft, and something extraordinary happened. I built ‘The Relevancy Engine’ out of the ashes of LeadCraft, replacing (and exceeding) its revenue within 60 days. The best bit… we had fewer customers. I’ve always talked about the importance of being Relevant to your audience, which was one of the core principles we built LeadCraft on. My success with LeadCraft also showed me how important it is to be omnipresent, and becoming ‘top of mind’ with the “right” people. But in the events that followed after we shut down LeadCraft, the final puzzle fell into place. It made so much sense, and I couldn’t believe I hadn’t seen it sooner. So I began developing, testing and iterating on a brand new methodology that is a true game-changer in the world of online marketing. If you want to quickly scale to a $1 million business, become #1 in your niche, and attract hundreds of quality clients… what I’m about to show you may change your life. I call it Relevancy + Omnipresence + Intimacy. Or, the ROI Method, for short. What is The ROI Method? 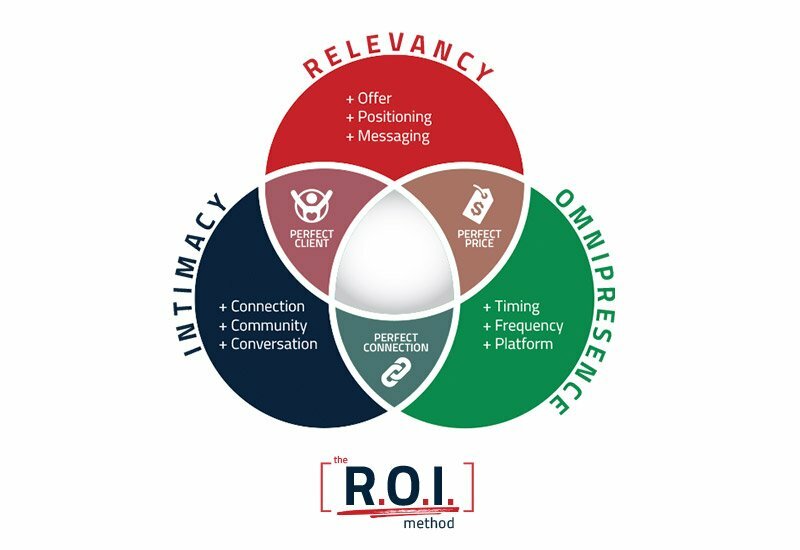 The ROI Method is a new approach to marketing. It’s a way to filter through all the noise out there and hone in on the exact right thing for your business. It’s based on illuminating your potential client’s pain, and then ethically offering to help them resolve it. This is the opposite of scarcity-driven marketing, which is what most online marketers focus on (and what I used to focus on, too). This new approach is different. 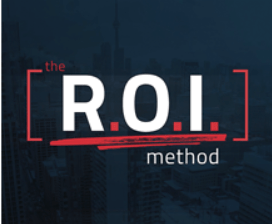 The ROI Method aligns your marketing and sales in a way so it truly serves your client. You build a better business — one filled with your perfect clients, a rock-solid and loyal community, and deeper, more profitable relationships. In this article, I’ll walk you through how it all works. It will blow your mind, so stay with me and read to the end. 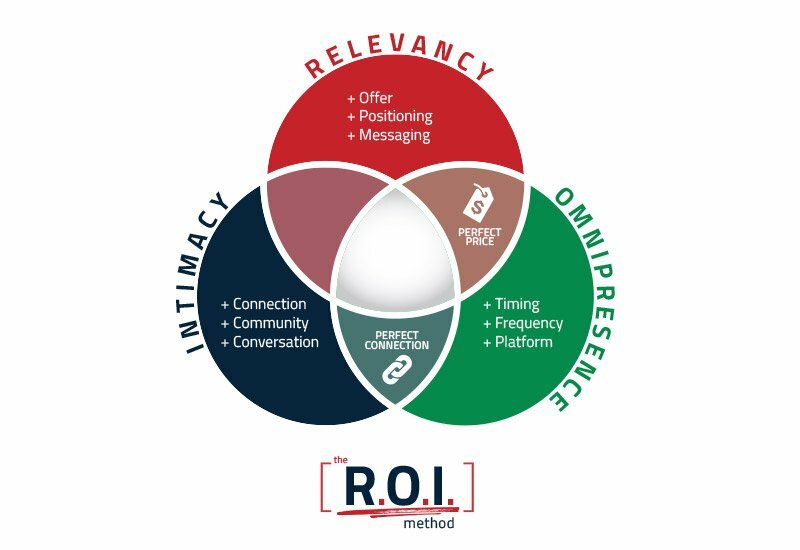 But before we get into what the ROI Method involves, let’s first see whether this is something YOU need. The problem is, you’re not sure what. You’re currently on the ‘six-figure hamster wheel’, and although it’s got you to where you are today, it WILL NOT help you scale to seven-figures and beyond. The ‘Six Figure Hamster Wheel’ hasn’t brought the freedom you wanted, and it never will! What we do inside The Relevancy Engine helps our clients escape this hell, so they can build a real business that creates a real impact. Just like I did when I blew up LeadCraft and regained control of MY life. Relevancy is what often springs to mind when you think of marketing. In essence, when I say Relevancy, I mean your marketing message and your funnel. 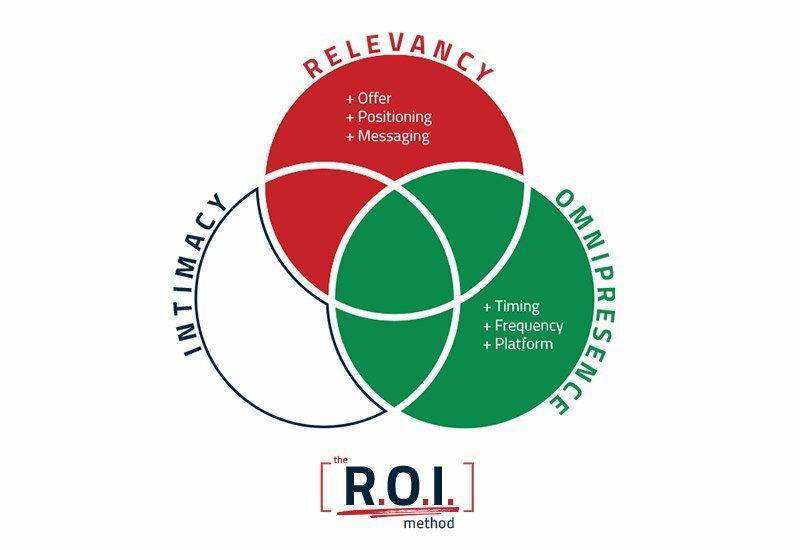 If the key to making a sale is giving the right message to the right person at the right time and place… Relevancy ensures you have the right message to begin with. First, they must admit there’s a problem in their life, business or relationship. This places them into “discovery mode”, meaning it’s your job to show them your process and unique method, as well as share personal stories with them that forge a true connection. In time, they think about buying into YOU as an authority. They begin to realise their problem, and must decide if they want to go from their pain to their vision. At this stage you must show them how your solution helps them do that. Finally, you show them the commitment is worth the result and you close the deal. Your Offer is whatever you’re selling. And no, this doesn’t have to focus on money. When we talk about offers, we’re including things like lead magnets, signing up for a webinar, or actually buying your program, product or service. You customize your offers based on where someone is at on their journey. If they’re discovering their pain, you give them a guide. If they’re ready to buy from you, you offer your program or service. Your Messaging focuses on the words you use to describe your offer, what it does for your prospect, and how they will benefit if they take you up on the offer. You align your messaging with your lead’s mindset, whether they’re in “discovery mode” or looking for a paid solution. Finally, your Positioning is how you differentiate yourself from the competition. Essentially, it’s showing what makes you special and showcases your unfair advantage. When you have these three things… You have Relevancy. Omnipresence is where you appear everywhere to your target audience. You become ‘top of mind’ and start to dominate their newsfeed (and everywhere else they go online). But because you’re relevant, you aren’t annoying. Something magical happens when you show up in someone’s life consistently. You transform into an authority figure. You become someone who cares. It’s as though you turn into a trusted friend, even though you may have never met. When you’re Omnipresent, it means you’re showing up at the right time, which has always been the Holy Grail of marketing (to be in the right place at the right time). With Omnipresence, that’s what you’re doing. You’re getting your name in front of your audience at the right time so you become the only choice for them. Further, it’s not just the timing of it, but the frequency. We don’t try and show up magically when they’re ready to make a decision. We show up consistently, in a way that offers value and builds a relationship over several days, weeks or months. Finally, you become Omnipresent with the right platform. For many people, omnipresence starts with retargeting and advertising on Facebook. But that’s just one channel. YouTube, email, ad networks, Instagram…all are channels where you can show up for your audience. Basically, you become an authority inside your niche. Most of what we do online is always about “more, more, more”. But Omnipresence is about depth. It’s taking a small number of leads and increasing your Relevancy by being in front of them with the right frequency, the right timing and on the right platforms. Intimacy is about creating real relationships. In today’s world, we face constant automation and technology. The people you serve crave a real connection with a real person. Somewhere along the way, online marketing became about making a quick buck rather than offering to help real human beings. When you create Connection, it means you’re honest and open with your audience about what’s really going on in your life and business. You don’t hide things. You don’t fudge numbers, or pretend that life is awesome when it’s not. You open up and get vulnerable. You allow people to see you’re a human being. You present real struggles that they can relate to. And you develop stronger relationships when you do. When you create Conversations, it means you make an effort to talk to members of your audience. So many people online run ads and don’t even do the most basic things…like reply to comments! Be involved in the Conversation. Respond to your emails. Reply to comments. Foster discussion in your Facebook groups. Care about your people enough to have deep conversations with them. Finally, when you create Community, you build a safe space for your audience. This isn’t just about having a Facebook group (although that’s a tactic I use). It’s about creating a place for your audience to network, support each other, and interact with you and your content. Humans are social, community centred beings, so build a tribe that you support (and that supports you in return). This is the 30,000ft view of The ROI Method. On their own, each of these concepts are powerful. If you’re stuck at 6-figures, it’s likely you have one of these three already working in some way. But you’re stuck where you are because you don’t have all three working together. Whereas when you turn all three of these on at once… you will blow up in your niche very quickly. Soon, I’ll show you what these results look like. But before I do, I want to show you what happens when you only focus on one. Focussing on ONE is often why entrepreneurs get stuck in the ‘six-figure hamster wheel’ to begin with. Neither of these is good. If you’re ONLY Relevant, and don’t invest your time or resources into being Omnipresent and Intimate, you become the Marketing Nobody. Well, think of the last time you saw an ad for an interesting product. Maybe you thought it was interesting, but you weren’t ready to buy at the time. So you got on with your day, only to never hear from that company again. You have no relationship with them, and no real reason to want to do business with them. They’re just another Marketing Nobody. So you forget about them, and when the time comes when you are ready to pull the trigger, they’re not on your radar. Alternatively, if you’re only Omnipresent, but you’re not Relevant or Intimate, you become the Mosquito. I’m sure you can guess what this means. It seems like you’re everywhere. The problem is, you aren’t speaking to the right people and you aren’t giving them the value they crave. Think of the social media guru who’s constantly on your newsfeed, but you have NO idea what they stand for, what they’re selling, or why you should care. They’re not Relevant, so they’re just an obnoxious and annoying mosquito. So those first two are bad, but what happens if you’re only Intimate, and never Relevant or Omnipresent? Well, typically, these are people you would love to hang out with, but who you’d never actually buy from. They’re nice and kind and caring, but it doesn’t result in you wanting to dive any deeper with them. You’re just a Harmless Friend. Nice to have around, but not someone to take seriously in business. The answer? NONE OF THEM! 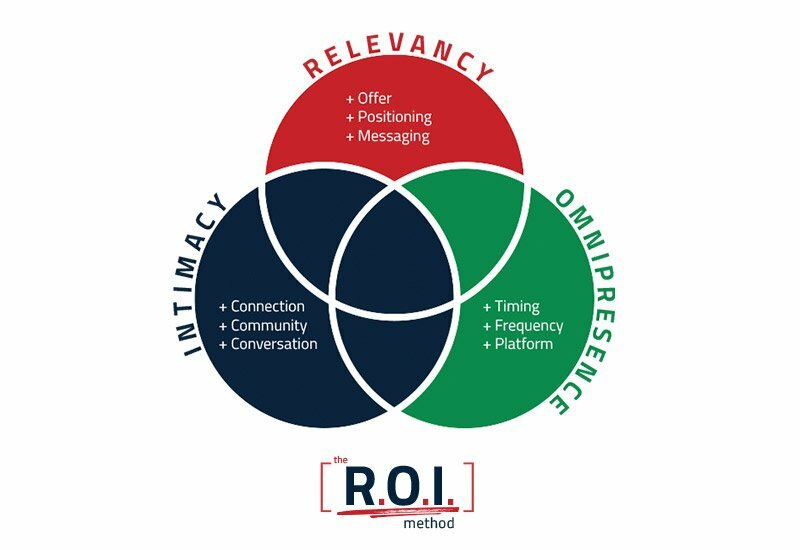 The magic happens when you combine all three elements of The ROI Method. The problem is, hardly anybody does this. Seriously, I know a lot of successful people who combine two, but only a few who use all three. Now, when you do use all three, something I like to call ‘The Nuclear Effect’ happens. You may have one of these working in your business already. Perhaps you’ve figured out how to charge exactly what you’re worth. Maybe you feel connected to your tribe. Or perhaps you already love the clients you work with. But how did you get there? It’s important we look at each of these, because it may highlight where you’re current strength is (and what you’re lacking elsewhere). You can trick yourself into thinking you have it all figured out when you have one of these. If you struggle with your cashflow, and it seems like there’s never enough money in the bank, then you likely aren’t charging what you’re worth. When you combine Relevancy and Omnipresence, you get the formula for charging the Perfect Price. When this happens… you can charge whatever you want. This is powerful, because this means you can work less but impact more. You need to charge your worth, but this only happens when you have both Relevancy + Omnipresence. But what happens when you combine omnipresence and intimacy…? Have you ever shown up on a call excited, but within two minutes realized there’s NO connection between you and the other person? And it’s a huge waste of time. If you’ve ever landed on a call like this, it’s because you lack the Perfect Connection. But when you combine Omnipresence with Intimacy, this is what you get. When you create connection, conversations and community, and then show up consistently in front of them, you’re doing exactly what humans do to create relationships. This is how we make friends. You did this at school, I’m sure, only this time you’re doing it at scale (and automatically), building connections with hundreds of people at a time. The beauty of this is that it works both ways. Not only do your audience members feel more connected to you because of what you share and how you show up, but you become more invested in your audience and the value they take away from you. This is how you create the Perfect Connection, and it all comes down to Omnipresence + Intimacy. But what about when you combine intimacy and relevance…? Have you ever taken on a client that wasn’t a 100% perfect fit? You know, someone who just didn’t get you, your values, or what you stand for? It feels like pulling teeth, doesn’t it? They look to you to save them, don’t take responsibility, and then gossip behind your back. We’ve all been there…taking on clients that aren’t a great fit because we thought we needed the money. You need to escape this hell, and you do so by combining Intimacy and Relevance. The result? Your Perfect Client. When you show your audience who you really are, you tend to attract the kind of person who resonates with you. When you’re open about your values, and what matters to you… the people who approach you tend to also share those values. When you work with like-minded people like this, you’re in flow. Now, as I said earlier, combining two of these three elements provides BIG results. I know a lot of people who have either The Perfect Price, Perfect Connection or Perfect Client, and they’re running successful businesses and having a big impact on the world. You are too, if you can relate to this. Because when you attract the Perfect Client, charge the Perfect Price, and create the Perfect Connection… something incredible happens. 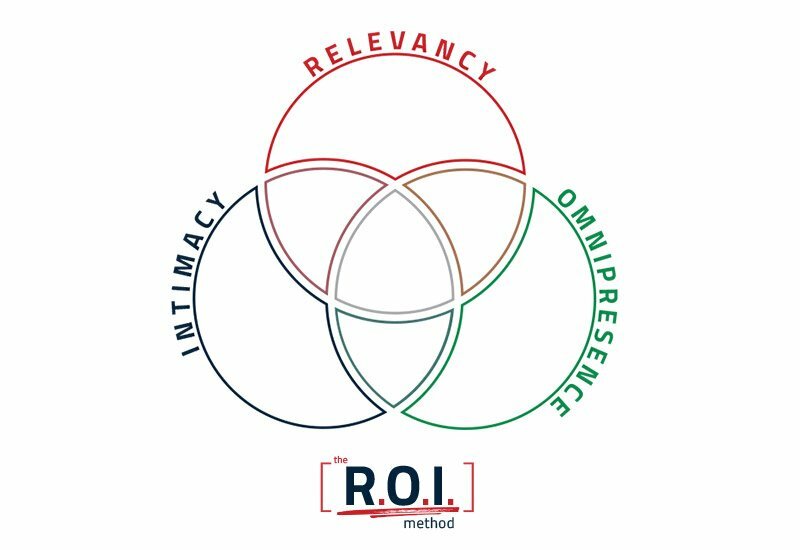 When you combine all three of Relevance + Omnipresence + Intimacy, you unlock exponential growth in your business. You become #1 in your niche. You build deeper, more profitable relationships than ever before. For years, online marketers have sold you a funnel, and taught you that the only point of having a business is to make more money. There’s more to money, and there’s more to having a “successful” business. It’s about more than just growing your revenue; it’s about creating a more evolved business (one that’s sustainable, scalable, has a rock solid foundation and is “future-proofed” from any economic collapse). 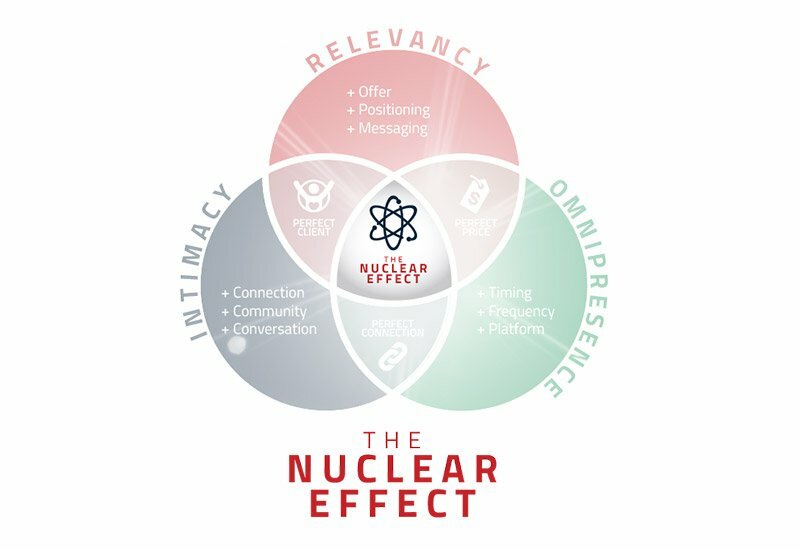 This is the effect I’ve seen since activating the Nuclear Effect in my own seven-figure businesses, and I’ve already started to help other entrepreneurs do the same. You create deeper, more meaningful Relationships. 1-on-1 Relationships are deeper than those with your audience members. And when you have a growing business and audience behind you, you’re able to also grow your relationships. You get access to better, more profitable partnerships. You find yourself getting into media outlets and leveraging PR. You have a network strong enough to build a powerful Mastermind, and you get access to new, exciting opportunities. Three currencies that go far beyond money and leads, which is something online marketing has overlooked all this time. But it’s these three currencies that will help you build a foundation for 7-figures and beyond… AND make you the #1 go-to expert in your niche (practically overnight). When you plug R.O.I. into your business, these three currencies begin to build off each other. This “currency flow” generates massive momentum without you having to hustle and grind every day. It allows you to sustainably grow to 7-figures without feeling like you’re having a panic attack. 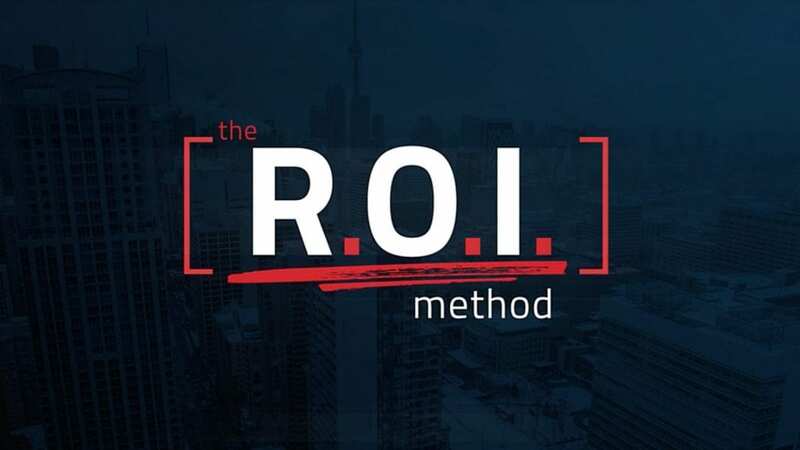 I feel like all my previous success, failure, mistakes, relationships, obstacles, good times, bad times and everything else has lead me to here and The ROI Method. This is no shiny new “thing”. 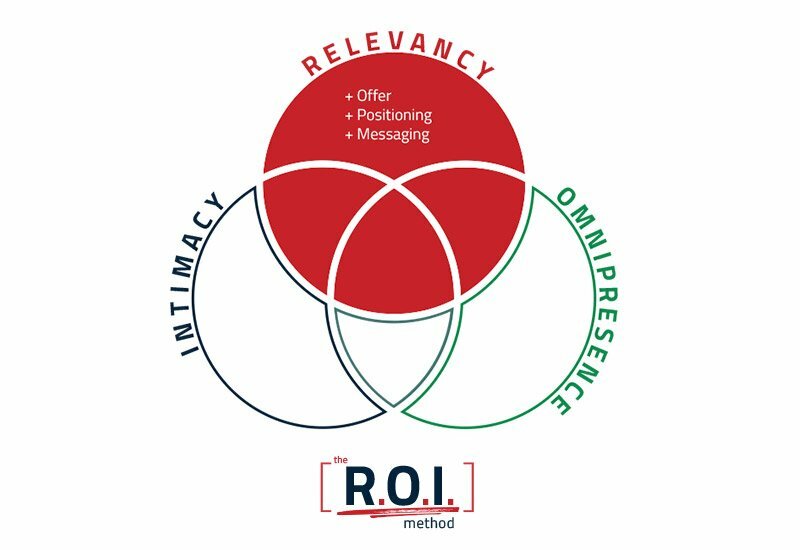 When I started to develop The ROI Method towards the end of 2017, I realized I had lacked Intimacy in my own business for years. I had built relevance and I was good at becoming ‘top of mind’, but I didn’t create the intimate connections I could have. Because of this, I didn’t generate clients that were a 100% great fit. This had a massive effect on me and my team (and business as a whole). Before she began implementing R.O.I. 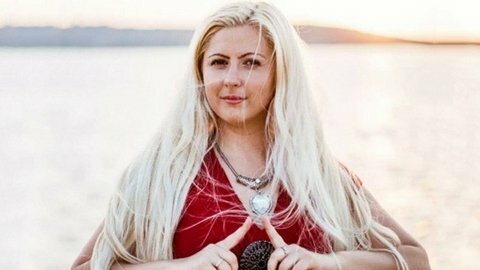 in her business, Katya averaged $25k/month. Within 60 days of using this framework, she had her first $100k month. Plus, she grew her audience massively, and has deepened her relationships. Sunny Lenarduzzi was in the mid-6 figures before she started to implement the R.O.I. Method. In 2017, she did 4x the revenue she did in 2016. Her audience grew by over 25%. And, with the relationships she’s built, she has begun securing popular speaking gigs, such as Traffic and Conversion 2018 and Social Media Marketing World. Pat runs a marketing and consulting company exclusively for financial advisors. When he started with the R.O.I. Method, he was generating around $20k-$30k a month. Now, within 90 days of implementing this into his business, he’s cleared multiple $100k months. They struggled to connect, they had trouble finding the right clients, or weren’t getting paid their worth. But each one of them committed to bringing together Relevancy, Omnipresence, and Intimacy and saw massive results. They’re no longer on the “Six-Figure Hamster Wheel”. They’re not uncertain about where the next client is coming from. Then I’ve created a program to help you implement R.O.I. inside your business within the next 90 days. This is more than just another “grow your business” program. It’s for those ready to create a legacy that will last for years, and who want the strategic guidance of a mentor, not a coach. That’s why I bring on established entrepreneurs, who have been where you are, so they can walk you through what it takes to 2x or 3x your business over the next 90 days. In 90 days, we help you implement a massively Relevant marketing message, become Omnipresent with it, and develop Intimacy.